Italy, Norway and Japan are already managing the F-35 and over the next three to four years, according to Vice Adm. Winter, the majority of international partners will receive their aircraft and declare Initial Operating Capability (IOC). The current F-35 Program of Record accounts for more than 3,000 aircraft, which will support the three U.S. military services and 11 international allies. With U.S. F-35 squadrons getting underway and international partners receiving and flying their own versions of the cutting-edge platform, the F-35 program is operating at a full sprint. That’s according to Vice Adm. Mat Winter, Program Executive Officer for the F-35 Joint Program Office, who offered an overview and update on the platform during the third day of the 2018 Sea-Air-Space Exposition April 11. During his presentation, he outlined the progress of the platform’s capabilities and its schedule. While describing the platform as a “multi-mission, multi-strike-capable aircraft” that will provide air superiority and air dominance well into the future, he stressed that the technological advantages the platform brings to the warfighter make it much more than just an aircraft. - Destroy targets deep in enemy territory. - Protect ground troops engaged in combat. - “Knock down the door” for other platforms. - Clear the skies of enemy aircraft. In addition to stealth, which allows the platform to persist in the battlespace, the F-35’s main capabilities include sensor fusion and interoperability, which enable the weapons system to collect critical data in the battlespace and share it among other strike fighters and other warfighting elements like surface ships and satellites. “[Sensor] fusion allows us to take the information across our sensor suites, fuse that together and present an operational picture not only to our pilots, but share it across the battlespace,” Winter said. That grants other assets insight about threats that they might otherwise not consider, thereby improving their own survivability and lethality. Winter also emphasized what he called the F-35 program’s “business side,” which focuses on the program’s economy of scale and the benefits of its many partnerships. “We’ve got to continue to make this an affordable, relevant capability for our warfighter,” he said. To keep the platform at the tactical edge, the systems outside the aircraft that support it are just as important as the advanced systems inside it, Winter said, citing the program’s Autonomic Logistics Information System, referred to as ALIS. The system ensures that the F-35’s pilots, maintainers, and acquisition and industrial personnel can all access the up-to-date, actionable information they need to guide their decisions. Laying out the program’s schedule, Winter said that 2017 has been a “heck of a year,” marking the completion of all hardware qualification and all flight test verification for the platform’s Block 3F software. 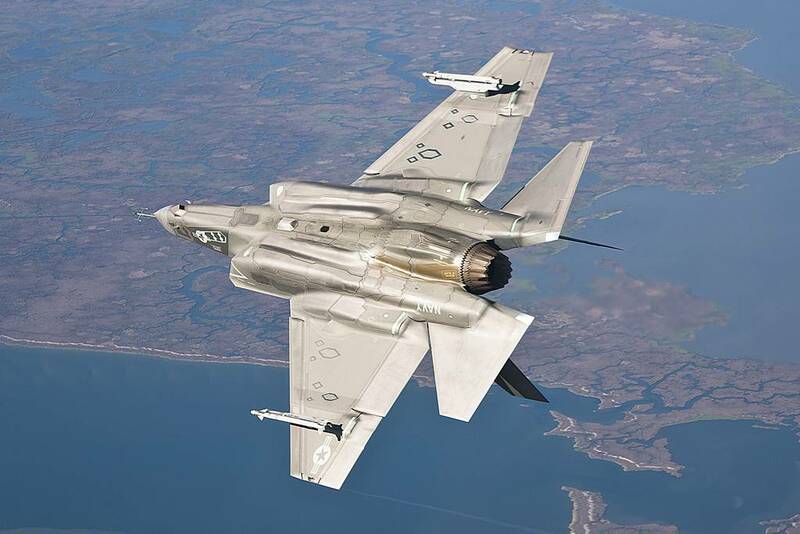 The Admiral told the Sea-Air-Space audience the F-35 would soon fly its final system development and demonstration flight test and reach a significant milestone for the program by safely completing more than 9,000 flight test hours without one aircraft or team member lost. Meanwhile, Italy, Norway and Japan are currently operating the F-35 in their countries as well.. Over the next three to four years, according to Winter, the majority of international partners will receive their aircraft and declare IOC. In March, the Marine Fighter Attack Squadron (VMFA) 121 took the F-35 on its first maritime deployment with USS Wasp (LHD-1). In the fall, the platform’s second maritime deployment will get underway with Marine Fighter Attack Squadron (VMFA) 211 on USS Essex.